Requirements were REWRITTEN effective January 1, 2004. Get swatches of two natural fiber fabrics (100 percent cotton, linen, wool or silk; no blends) Get swatches of two synthetic fiber fabrics (nylon, polyester, acrylic, olefin, or spandex). Get a sample of one cellulosic fabric (rayon, acetate or lyocell). Give the origin, major characteristics, and general content of each type of fiber obtained for 2(a). Explain the difference between a cellulosic manufactured fiber and a synthetic manufactured fiber. Describe the main steps in making raw fiber into yarn, and yarn into fabric. Assume you will soon buy a new garment or other textile item. Tell your counselor what fiber or blend of fibers you want the item to be, and give reasons for your choice. 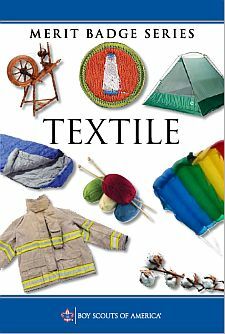 Visit a textile plant, textile products manufacturer or textile school or college. Report on what you saw and learned. Weave a belt, headband, place mat or wall hanging. Use a simple loom that you have made yourself. With a magnifying glass, examine a woven fabric, a nonwoven fabric, and a knitted fabric. Sketch what you see. Explain how the three constructions are different. Make a piece of felt. Make two natural dyes and use them to dye a garment or a piece of fabric. Demonstrate how to identify fibers, using a microscope identification or the breaking test.